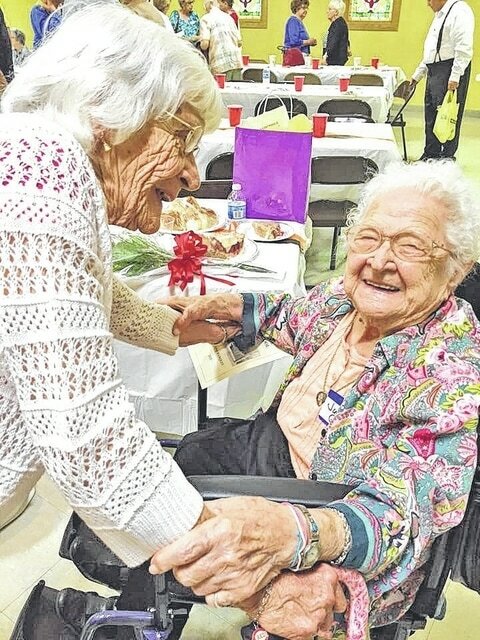 June Greg, 104 years old, and Bainbridge alumni Thelma “Tiny” Free Holbert, are pictured at the Bainbridge Alumni Luncheon. Sixty-plus Bainbridge alumni, friends and family attended the Bainbridge Alumni Luncheon held at the Bainbridge United Methodist Church on Saturday, June 13. A time of fellowship and memories was held prior to the luncheon. Bob Richardson, class of 1953, welcomed all. The invocation was given by John Stultz, class of 1945. Pete Nelson, class of 1954, read the roll call of 19 alumni deceased in the past year, with Don Kretzer (1954) tolling a bell after each name was read. Nancy Baum, music teacher, was recognized as a special guest. Richardson announced Clay Stratton as the $400 scholarship recipient. It was noted Kathryn Schmidt Brown (1931) is the oldest living female of the group and Allen Knisley (1936) is the oldest living male. Neither was able to attend this year. The oldest female alumni in attendance, Lida Lee Benner Wall (1946), was recognized and given a corsage. Kenneth E. Houseman was given a boutonniere as the oldest living male alumni present. David A. Davis (1954) of Navasota, Texas was recognized for traveling the greatest distance to the luncheon. All graduates who are veterans were recognized and given thanks for their service. June Gregg, a staple in the Bainbridge community, was given an honorary membership and a red rose. June graduated from Twin High School in Bourneville. Special recognition was given to the class of 1955 for 60 years. In attendance from 1955 were Ada Stultz Jordan, Shirley Kellough Longo, Eileen Meldick Hatfield, Mary Compher Hoylman, Cherry Darbyshire Miller, Mary Ann Vore Warning and David Brown. Sharma Knisley and a crew of volunteers served a delicious luncheon of chicken or baked steak, salad, mashed potatoes, green beans and rolls. An array of pies and cakes were enjoyed. Richardson recognized helpers – Eileen Hatfield (1955) and Don Kretzer (1954) and gave the closing benediction. Next year’s luncheon is tentatively scheduled at the same place on Saturday, June 11.